Absolute value function is one of the topics in which we are going to see about solving for x in absolute value and graphing the absolute-value-function. The absolute value of a number is its distance from 0 on a number line. For example, the number "9" is 9 units away from zero. So its absolute value is 9. Negative numbers are more interesting compared to positive numbers,because the number -4 is still 4 units away from 0. The absolute value of the number -4 is therefore positive 4 . 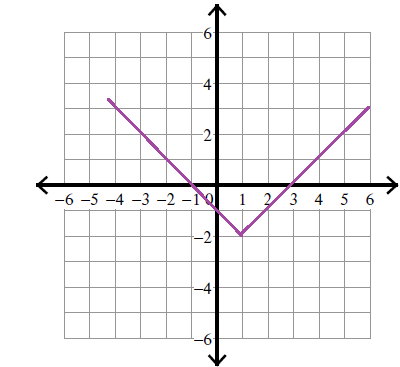 An absolute value equation graphs like a "V". General form for Absolute function y = a |x – h| + k or y – k =a|x-h|. Here (h, k) is vertex. If “a” is negative the graph will be open downward. Here we need to consider the given question as y-k = a |x-h| Comparing with general form now we haveY-0 = |x -1| So the vertex is (1, 0) and instead of a we have +1.so the graph will be open upward.To find the x-intercept we have to put y=0 so that we will get x =1.There fore the x-intercept is 1. 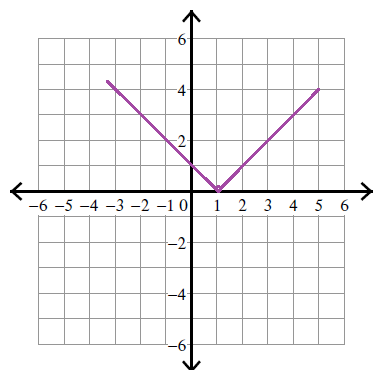 Here vertex is (1,-2) and the graph will be open upward because the value of a is positive. By using the above problems you can understand the topic absolute value function better.